London Luton Airport aims to more than double its capacity from 18m to 38m passengers a year by 2050. 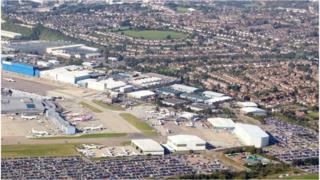 The airport, owned by Luton Borough Council, has published its growth plan for 240,000 flights a year. More than 30,000 jobs depend on the airport, councillor Andy Malcolm, chair of London Luton Airport Limited said. Campaigners claim aircraft noise has increased tenfold since 2013, and it "badly affects nearby towns and villages". They also said the government had failed to step in to constrain the airport. "This airport is effectively unregulated," Andrew Lambourne of campaign group LADACAN said. "Expansion was geared to promises about noise reduction, including quieter aircraft. "Just two new-engined planes use Luton, and many smaller quieter planes have been replaced by larger noisier ones," the campaign group said. Mr Malcolm said: "The airport generates £25.6m for Luton Borough Council, paying for vital services and infrastructure investment. It also supports 30,000 jobs across Bedfordshire, Hertfordshire and Buckinghamshire." Managers claim every 1m additional passengers adds £76m to the regional economy. The airport aims to reach its 38m passenger target with 240,000 flights using its one runway. The airport has also pledged "to minimise environmental impacts" and to ensure economic benefits reach "local and sub-regional communities and economies".